Today is a conundrum for me. A day of decision. A day that leads to the cross for many is leading to a crossroad for me. When I was a low church Protestant kid, I was mesmerized by the Catholic and Anglican kids who came to school with smudges on their foreheads, talking about ashes and Lent and giving up things and preparing for Easter. It seemed like a deep mystery, an ancient rite. My church didn’t have any mystery and was very suspicious of rites. When I became an adult, I pursued the mystery, leaving my rite-less denomination for the smells and bells of the Roman church. My first Ash Wednesday was a really big deal. Getting smudged meant more than just “from dust to dust.” It meant I was entering Lent, which was the portico of my entrance into the church at the Easter vigil. When I would be a real legitimate member with all rights (and rites) and privileges. It was a very, very big deal. I have always loved Ash Wednesday – the start of a period of reflection, of preparing, of forgiveness, of seeking holiness and searching for truth. Now things are much different. Last year, I started to doubt the veracity of all of this, of everything I had built my life on. God. Jesus. The Bible. Salvation. The Holy Spirit. Heaven. Hell. Revelation. I stopped seeing real meaning in the things I had always loved. Smells. Bells. Liturgy. Prayers. Hymns. Rites. Communion. I didn’t choose this. I didn’t choose to lose my faith. I didn’t get angry with the church or anyone in it. I wasn’t trying to justify doing something heinous. I wasn’t being influenced by anyone to give up my faith. It just happened. For months, the thought of losing the entire foundation of my life scared me more than I can describe. Recently I stopped being afraid. It feels good. I was starting to accept my new state of being. But now I have to deal with Ash Wednesday…. This is the first Ash Wednesday in memory when I do not want to go to church. 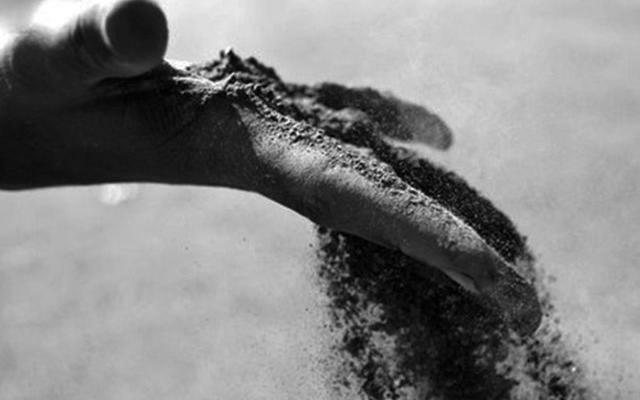 The only part I believe anymore is the part about coming from dust and returning to dust. That much is verifiable. There is a part of me that wants to give God another chance during Lent 2015. A part of me that wants to throw myself fully into the Lenten experience, to go to Ash Wednesday service and receive the reminder of my humanity on my forehead, to pray and read and study fervently, to do all the prescribed things in preparation for the celebration of Easter, to open my mind and my heart for divine inspiration in hopes that the foundation of my life will be restored. The rest of me just wants to slap a Chiquita Banana sticker on my forehead a la Penn Jillette and call it a day. So what’s it going to be? Do I go to Ash Wednesday services and pursue God one more time? Do I go just to keep up appearances while keeping my faithlessness secret and to myself? Or do I decide to be honest and admit I don’t believe in any of this anymore? The first – a last ditch effort to see if God is real or if I can overcome my disbelief – would take a lot of energy and time. I’m not sure if I even care that much anymore, but I’m willing to try one more time for the sake of my family. The third would be the hardest. If I admit to the world that I no longer believe, it will be hell on earth for me. I will no longer have the choice of whether to talk about it or not. It will be out there and cannot be retrieved. I will have a lot of explaining to do. I will have hundreds of people pounding me with questions and praying for me and crying over me and worrying about my eternal destination. It will impact every single relationship I have. Every. One. Maybe even to the point of loss. is it possible to wear both ashes and banana stickers? *Sigh* – I don’t think so. I don’t have long to make a decision about what I’m going to do about today. But we are out of bananas so I’m going to the store…just in case. ← is there prayer without god? I’m in a knot over lent and easter too. 2015 is the first year I won’t be throwing myself into it. This holy season meant *everything* to me in the past, and the Easter Vigil was the pinnacle of all sacred and beautiful things. Now I’m just sad. I’m a sad atheist. Maybe I’ll learn how to be a happy atheist as I get further away from the church. Maybe. Violet, I think it is ok to admit there was true joy in our former lives. I was sincere about my beliefs, and everything I did had meaning. I was a happy and giving person. But now I no longer believe that was a gift from God. I believe it was a gift from my parents, from my joyous family, from my own chosen outlook on life. Just as I never believed my post partum depression or my miscarriage or my infertility (etc) were punishments from God. Maybe we don’t believe in what these rituals mean anymore. It doesn’t mean there is no beauty in them. They may be directed towards a god, but they are HUMAN rituals, which means there was something crying out to be expressed in our HUMAN existence and it ended up being ensconced in religion. I have always found beauty in expressions of other religions as well, even when I didn’t believe the premise behind them. As rational people, we can choose what to keep and what to let go of. We no longer have to conform with ANYONE, including other atheists. The good thing is, we no longer have to believe doing these things saves us from something or makes us better than people who know nothing of them. And if we choose not to experience the seasons we once loved, that’s ok too. Happiness doesn’t come from them anyway, but from the deepest experience of sharing life with people we love. I’m glad I found your blog. Wow I LOVE your reply to Violet!!!!! I think the universe guided you, as it so often does. I remember talking to the lady who cut my hair when I was a teenager and she was telling me, that she loved easter, and not eating meat on Good Friday. She said not eating meat made her feel closer to God. I already had my doubts about this whole ritual thing, and I remember thinking to myself…why does God care if you eat meat on a certain day or not, but it also made me think about rituals in a different way. I see rituals as also another thing that gives us some certainty and thus they become comforting. And since we rationalize our behavior we have to come up with a reason why we are doing the ritual, otherwise doing the ritual would seem silly indeed. When you look at the formation of newer religions and denominations like Protestants, Sikhism, Sufiism, many of these movement were borne out of a religion that was old and had become mired in rituals, and these movements were ones of enlightenment that tried to create a belief system that cut out rituals, focused on doing good works and having a personal relationship with God.